I got out of bed the wrong way yesterday .... I kind of fell out in a heap on the pessimistic side of the bed, which one could argue is every side of the bed because let's face it - I just don't like getting out of bed. It's not that I am not looking forward to the day ahead, its more because I just love my bed and sleep and I'm lazy .... or I just wasn't feeling it that particular morning. Whatever - either reason works for me. 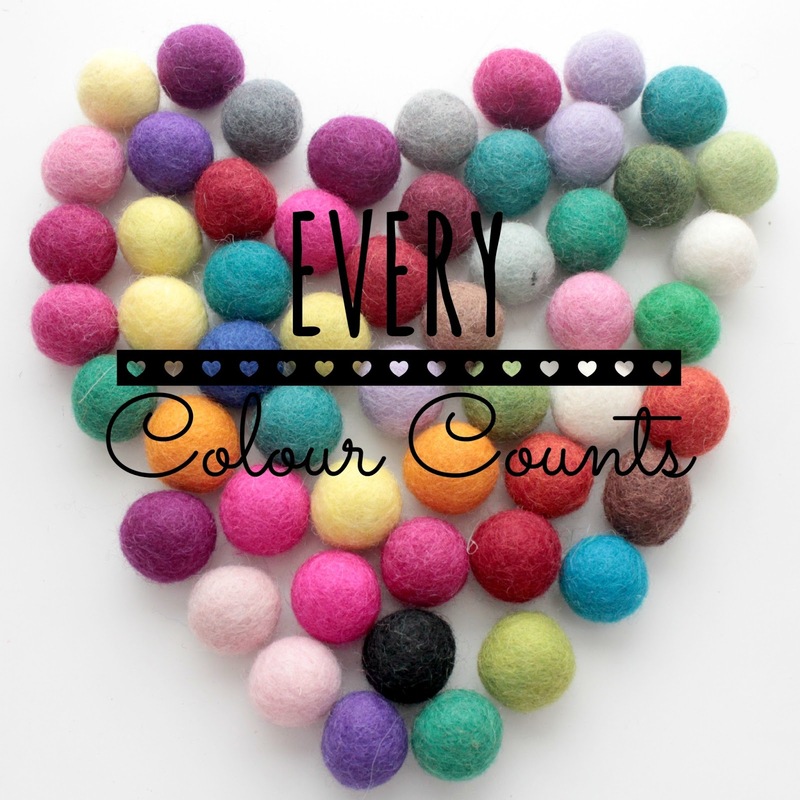 So what has this all got to do with colours and pretty pictures of felt balls you ask? A lot really. 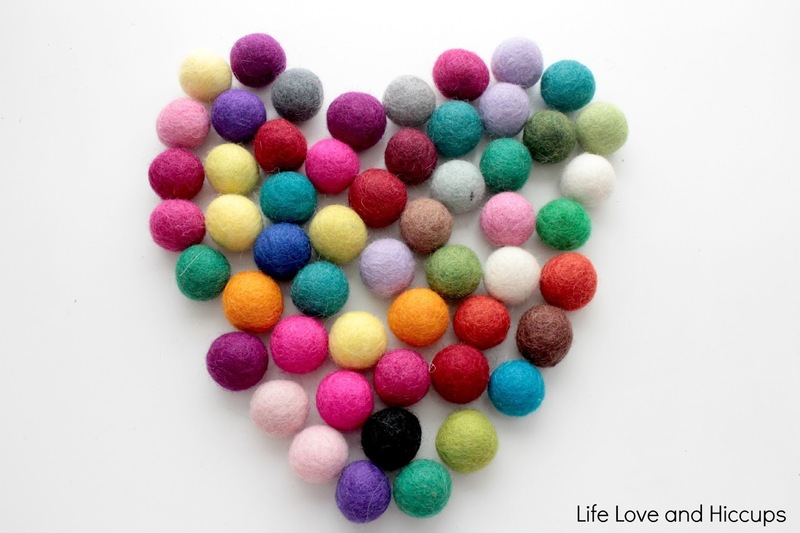 You see I have a little addiction (yes yet another one) to little coloured felt balls. I often get asked on instagram where I buy my felt balls from and in case you too are interested, it is FELT FOXES on etsy. I have a big jar of these in my office and when I am bored I like to make pictures with them or just randomly pick out colours to reflect what I am feeling. I love to thread them onto cotton and make little garlands for around the house. Not only does it create gorgeous little surprise pops of colour around our home, the act of the threading them is therapeutic in itself. When my kids get home from school I am usually tucked away in my office working. They come in for a hug and a quick chat and often they ask if they can choose a coloured ball to thread. And of course the answer is yes, but on the condition that they choose a colour that reflects how they are feeling at that very moment and share with me why they chose that particular colour. Most days (fortunately) they pick a nice bright colour and tell me of how happy they were when they played handball with their friends or they did well in a test at school. But occasionally they pick a dull colour and talk about how something got them down that day or made them sad. I tell them that's OK to feel like that every now and then. Those days, those dull colours are just as important as the bright ones because without them, we cant see how truly magnificent the brightly coloured balls are. And just like the dull brown felt ball I chose to thread yesterday morning when I got out of bed feeling blah, those dull colours will disappear into the bigger picture. They are there but they are not overshadowed by the gorgeous shades, by the brighter days. And when you look at your life like a piece of art or a colourful felt garland, you realise that every day, both good and bad, adds depth and definition to your life. Every moment whether happy or sad is important. What colour are you feeling today?